Our local NOAA tide station in Charleston has documented an average rate of sea level rise (SLR) of 0.84 mm (0.03 inches) per year averaged over the past 30 years (0.27 feet in 100 years). The rate of SLR is expected to accelerate over time. For example, according to the National Research Council (NRC), predicted SLR rates for the area to the north of California’s Cape Mendocino (the study’s closest site to the Coos estuary), are reported as high as +23 cm (9 inches) by 2030; +48 cm (19 inches) by 2050; and +143 cm (56 inches) by 2100. Apart from the obvious effects on developed lowlands in the project area (residential, commercial, and industrial lands), sea level rise (SLR) has the potential to affect clam and oyster habitat. SLR could change the duration and frequency of tidal inundation and tidal current velocities in the sand flat, mud flat, and channel bank habitats favored by clams and oysters. Change in the quality of these habitats will unquestionably affect where clams and oysters will be able to survive. However, one very important unanswered question is how much change will actually occur as sea levels rise. Scientists have not yet determined whether sand flat and mudflat elevations relative to tidal levels will be able to keep pace with SLR. 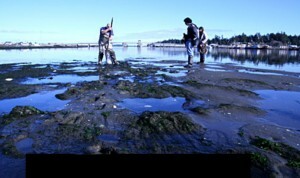 In other words, sedimentation rates may adjust with sea level rise so sand and mud flats remain about the same elevation relative to tidal levels as they are now, resulting in very little change in the abundance and species composition of current clam and oyster habitat in the Coos estuary. Determining the likelihood of these habitats to keep pace with SLR is the subject of several research proposals for which scientists are currently seeking funding. Other changes to the physical characteristics of these habitats are likely to have a direct effect on the status of the benthic community. According to a recently published study by Yamanaka et al. (2013)(based on three estuaries in the United Kingdom), anticipated physical SLR-related changes to clam and oyster habitat include coarser sediment grain size; steeper channel bank, sand and mud flat slopes; higher salinities; and higher exposure to wave action. They also suggest changes may be further exacerbated by other characteristics often associated with climate change, such as increased frequency of storms. Clams and oysters, having shells made from calcium carbonate, are at particular risk from the lowering pH levels of ocean waters. According to researchers including Barton et al. (2012), the relative corrosiveness of seawater caused by lowering pH levels may cause adult and juvenile bivalves to have trouble forming and maintaining their shells. Because of changes in the carbonate chemistry of the increasingly acidic ocean waters, fewer carbonate ions are available for uptake by marine organisms. Carbonate ions are the primary building blocks for bivalve shells. Shellfish hatcheries on the West Coast have been directly affected by ocean acidification. For example, in 2007, the Whiskey Creek Shellfish Hatchery in Netarts Bay, OR suffered losses in commercial Pacific oyster (Crassostrea gigas) larvae production. Oyster larvae were dying because they couldn’t build their shells in the low pH seawater used at the hatchery; without shells, oyster larvae can’t form feeding and swimming appendages (Barton et al. 2012). Increasing ocean temperature is likely to affect clams and oysters by contributing to sea level rise (SLR) and by contributing to an increased frequency and duration of harmful algal blooms. Research shows a strong correlation between increasing ocean temperature and sea-level rise (Rahmstorf 2007; Domingues 2008; Vermeer and Rahmstorf 2009). As ocean water temperature increases, it expands, filling larger volumes. Higher ocean temperatures also contribute to SLR by accelerating glacier and polar ice cap melting, by providing lubricating melt water, and by promoting the loss of buttressing ice shelves that support ice further inland (Rahmstorf 2007). Rising sea levels will likely affect clam and oyster habitat as described previously in this overview. Other ocean temperature-SLR feedback loops exist. For example, research suggests a positive correlation between ocean temperature and increased severity and frequency of storms (Knutson et al. 2010; Webster et al. 2005; McCabe et al. 2001). This is likely to worsen the anticipated impacts of sea level rise on bivalves (Yamanaka et al. 2013). According to the United States Environmental Protection Service (USEPA), increasing ocean temperatures may also contribute to an increased frequency and intensity of harmful algal blooms (HABs). Combined with other climate-related changes including high nutrient levels, warm ocean waters provide the ideal conditions for explosive algae growth (USEPA 2013a). These overly abundant algal “blooms” can damage aquatic ecosystems by blocking sunlight and depleting the oxygen required by other organisms, including those that directly or indirectly contribute to clam and oyster food resources (USEPA 2013a). Worldwide, ocean temperatures rose at an average rate of 0.07° C (0.13° F) per decade between 1901 and 2012. Since 1880, when reliable ocean temperature observations first began, there have been no periods with higher ocean temperatures than those during the period from 1982 – 2012. The periods between 1910 and 1940 (after a cooling period between 1880 and 1910), and 1970 and the present are the times within which ocean temperatures have mainly increased. Describing how the worldwide trend translates to trends off the Oregon coast is a complicated matter. Sea surface temperatures are highly variable due to coastal upwelling processes and other climatic events that occur in irregular cycles (e.g., El Niño events). We do have 27 years (1967-1994) of water temperature data collected from near the mouth of the Coos estuary that indicate through preliminary analyses a very weak trend towards warming water temperatures. Fifteen years (1995-2010) of data from multiple stations further up the South Slough estuary show very little water temperature change. Since the late 18th century, the average open ocean surface pH levels worldwide have decreased by about 0.1 pH units, a decrease of pH from about 8.2 before the industrial revolution to about 8.1 today. A 0.1 change in pH is significant since it represents about a 30 percent increase in ocean acidity (the pH scale is logarithmic, meaning that for every one point change in pH, the actual concentration changes by a factor of ten). Scientists estimate that by 2100 ocean waters could be nearly 150% more acidic than they are now, resulting in ocean acidity not experienced on earth in 20 million years. The best Pacific Northwest ocean acidification data we have so far are from the Puget Sound area, where pH has decreased about as much as the worldwide average (a decrease ranging from 0.05 to 0.15 units). One example of a potential algal bloom that produces toxins harmful to humans and animals is cyanobacteria (blue-green “algae”). Cyanobacteria are particularly well-suited for increased exposure to UV radiation, higher ocean temperatures, and low-oxygen environments, because they evolved in ancient oceans that had many of the same characteristics as climate-altered modern oceans (Paul 2008). The exposure of clams and oysters (as well as other shellfish) to blooms of cyanobacteria and other HABs places these bivalves off-limits for human consumption. In communities with commercial clam, oyster, and other shellfish fisheries, HABs represent real potential costs to regional economies (Hoagland et al. 2002). Warming ocean trends may also promote the establishment of invasive species in coastal and estuarine waters, potentially exacerbating HABs, disrupting clam and oyster food resources, and introducing new parasites to clam and oyster (and other shellfish) populations. Research suggests that warmer ocean temperatures may give introduced species a competitive edge by increasing the magnitude of growth and recruitment of exotic species relative to their native counterparts (Stachowicz et al. 2002). Warmer ocean temperature regimes may alter the species composition of local biota by facilitating the movement of temperature-constrained marine and estuarine species towards areas formerly too cool for habitation. In the case of exotic species transported across oceans or continents by humans, warmer ocean waters may provide increasingly suitable habitats for purposefully or inadvertently introduced invasive species, creating additional threats to local clam and oyster populations (Stachowicz et al. 2002). On the Oregon coast, there are several plankton species that can have adverse ecological and socioeconomic effects through harmful algal blooms (HABs). Local diatoms and dinoflagellates (Pseduo-nitzchia spp., Alexandrium spp., and Akashiwo sanguinea) produce a neurotoxin that is associated with amnesic shellfish poisoning in humans. “Alexandrium blooms” appear to be primarily responsible for HABs and the closure of shellfisheries on the southern Oregon coast. Contamination of shellfish south of Cape Blanco is strongly correlated with late-summer upwelling, and the expected changes to upwelling patterns associated with climate change may significantly affect the frequency and distribution of HABs on the west coast. Their study suggests that the effects of SLR on clam and oyster habitat are likely to be determined by the varied and complex interactions among all these physical habitat attributes rather than any one factor acting alone. They warn that accelerated sea level rise is likely to make estuarine intertidal areas less diverse and less productive through declines in species abundance, diversity, and “community metabolism” (a measure of the oxygen consumed by all individual invertebrates, used as an index of ecosystem function). These negative effects are potentially intensified by coastal development pressures. As sea levels rise, it is unlikely that coastal communities will allow intertidal habitats to migrate inland where high value real estate exists. Consequently, intertidal estuarine organisms like clams and oysters may be at high risk for being squeezed between unfavorable changes to their environment and hard coastal defenses (Yamanaka et al. 2013). 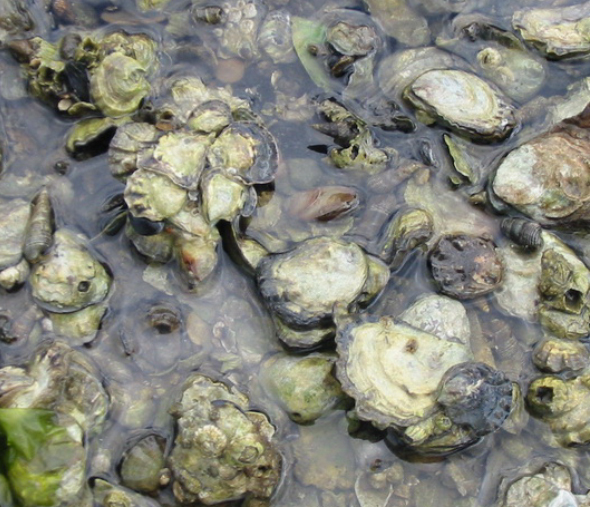 Acidification may indirectly impact clams and oysters by limiting food availability. Research suggests that a reduction in carbonate ions may negatively affect “calcifying” plankton species that require specific water chemistry for maintaining external calcium carbonate skeletons (Orr et al. 2005; Fabry et al. 2008). Plankton species may also be impacted by a decrease in other critical nutrients. For example, Shi et al. (2010) have demonstrated that acidification has a harmful effect on marine phytoplankton by limiting the bioavailability of iron. Bakun, A. 1990. Global climate change and intensification of coastal ocean upwelling. Science 247(4939): 198-201. Barton A., B. Hales, G. G. Waldbusser, C. Langdon, and R. A. Feely. 2012. The Pacific oyster, Crassostrea gigas, shows negative correlation to naturally elevated carbon dioxide levels: Implications for near-term ocean acidification effects. Limnology and Oceanography 57(3): 698-710. Cornu, C. E., J. Souder, J. Hamilton, A. Helms, R. Rimler, B. Joyce, F. Reasor, T. Pedersen, E. Wright, R. Namitz, J. Bragg, and B. Tanner. 2012. Partnership for Coastal Watersheds State of the South Slough and Coastal Frontal Watersheds. [Report prepared for the Partnership for Coastal Watersheds Steering Committee]. South Slough National Estuarine Research Reserve and Coos Watershed Association. 225 pp. Domingues, C. M., J. A. Church, N. J. White, P. J. Gleckler, S. E. Wijffels, P. M. Barker, and J. R. Dunn. 2008. Improved estimates of upper-ocean warming and multi-decadal sea-level rise. Nature 453: 1090-1094. Fabry, V. J., B. A. Seibel, R. A. Feely, and J. C. Orr. 2008. Impacts of ocean acidification on marine fauna and ecosystem processes. ICES Journal of Marine Science: Journal du Conseil 65(3): 414-432. Feely, R. A., S. R. Alin, J. Newton, C. L. Sabine, M. Warner, A. Devol, C. Krembs, and C. Maloy. 2010. The combined effects of ocean acidification, mixing, and respiration on pH and carbonate saturation in an urbanized estuary. Estuarine, Coastal and Shelf Science 88(4): 442-449. Hoagland, P., D. M. Anderson, Y. Kaoru, and A.W. White. 2002. The Economic Effects of Harmful Algal Blooms in the United States: Assessment Issues, and Information Needs. Estuaries 25: 819-837. Knutson, T. R., J. L. McBride, J. Chan, K. Emanuel, G. Holland, C. Landsea, I. Held, J. P. Kossin, A. K. Srivastava, and M. Sugi. 2010. Tropical Cyclones and Climate Change. Nature Geoscience 3(3): 1-37. McCabe, G. J., M. P. Clark, and M. C. Serreze. 2001. Trends in Northern Hemisphere surface cyclone frequency and intensity. Journal of Climate 14: 2763–2768. National Research Council (NRC). 2012. Sea-Level Rise for the Coasts of California, Oregon, and Washington: Past, Present, and Future. Washington, DC: The National Academies Press. 201 pp. Orr, J. C., V. J. Fabry, O. Aumont, L. Bopp, S. C. Doney, R. A. Feely, and A. Yool. 2005. Anthropogenic ocean acidification over the twenty-first century and its impact on calcifying organisms. Nature 437(7059): 681-686. Research Needs. Advances in Experimental Medicine and Biology (619): 239-257. Rahmstorf, S. 2007. A Semi-Empirical Approach to Projecting Future Sea-Level Rise. Science 317: 1866d. Schwing, F. B. and R. Mendelssohn. 1997. Increased coastal upwelling in the California Current System. Journal of Geophysical Research: Oceans 102(C2): 3421-3438. Shi, D., Y. Xu, B. M. Hopkinson, and F. M. Morel. 2010. Effect of ocean acidification on iron availability to marine phytoplankton. Science 327(5966): 676-679. Stachowicz, J. J., J. R. Terwin, R. B. Whitlatch, and R. W. Osman. 2002. Linking climate change and biological invasions: Ocean warming facilitates nonindigenous species invasions. Proceedings of the National Academy of Sciences 99(24): 15497-15500. Tweddle, J. F., P. G. Strutton, D. G. Foley, L. O’Higgins, A. M. Wood, B. Scott, and Z. Forster. 2010. Relationships among upwelling, phytoplankton blooms, and phycotoxins in coastal Oregon shellfish. Marine Ecology Progress Series 405(April): 131-145. Vermeer, M. and S. Rahmstorf. 2009. Global Sea Level Linked to Global Temperature. Proceedings of the National Academy of Sciences 106(51): 21527-21532. Webster, P. J., G. J. Holland, J. A. Curry, and H. R. Chang. 2005. Changes in Tropical Cyclone Number, Duration, and Intensity in a Warming Environment. Science 309: 1844-1846. Yamanaka, T., D. Raffaelli, and P. White. 2013. Non-linear interactions determine the impact of sea-level rise on estuarine benthic biodiversity and ecosystem processes. PLoS ONE 8(7): 1-8.